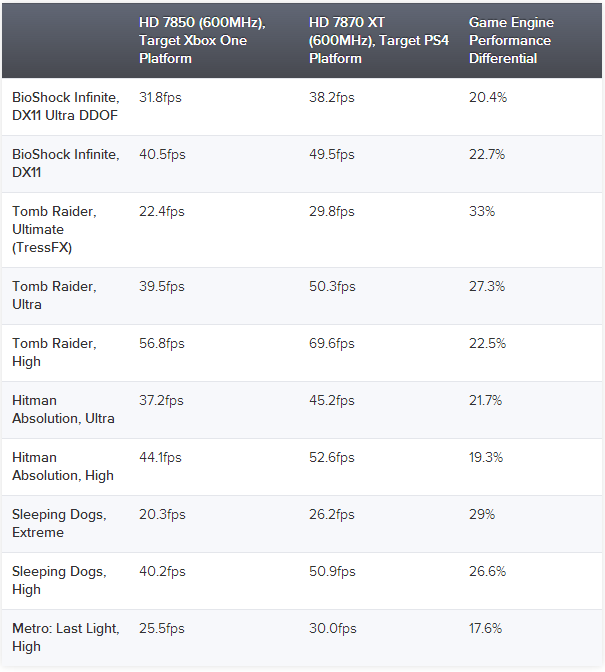 PS4 has 50% more raw power than the Xbox One, but does it matter? Sony' Playstation 4 has 50 percent more raw computational power than the Xbox One, but how it will impact on actual gameplay? Will the games on PS4 perform 50% better? Eurogamer's Digital Foundry team decided to perform a test by building PC rigs with hardware that are based on the same basic AMD architecture as the PS4 and Xbox One and running several PC gaming benchmarks on both systems. Don't they have the exact same CPU? So the real difference is in the RAM and the GPU. We can count out the difference in RAM in gameplay FPS as the difference would be minuscule. So it's entirely up to the GPU. How is the 7870 50% better than the 7850? Actually xbox one have something like 7770 but 10% is reserved for OS. Microsoft tweaked up the clock speed of Xbox One GPU from 800MHz to 853MHz! That bump in clock speed is gonna make a 5-10% performance difference at best. Can I go back to my original question of, how is the PS4 supposed to be 50% more powerful? The consoles are actually quite closely matched. I would argue a 15 -20% difference at most. Yeah, it'll be around 15% faster.